You know those projects that you are working on and all the while you hear that little voice in your head saying “really?? ?” I’m not the only one that happens to am I? 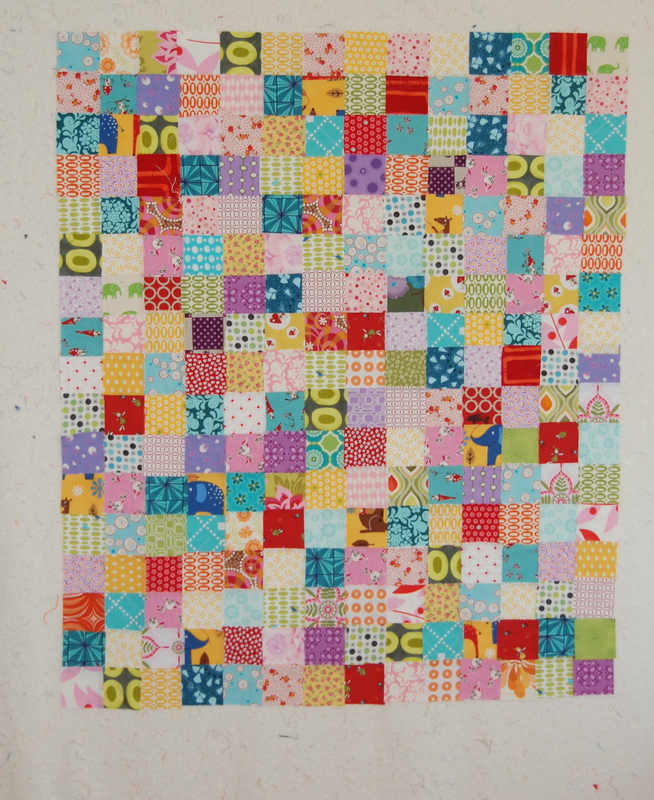 Well, recently my little patchwork project became one of those….. questionable projects for me. 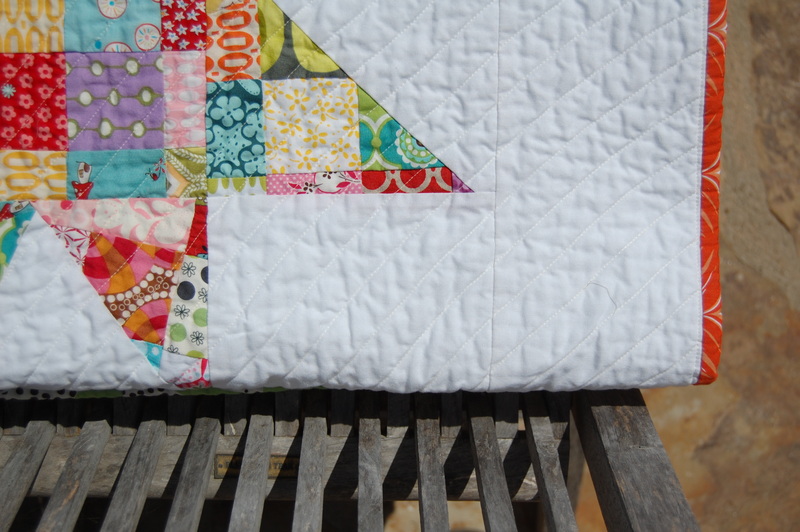 I love a sweet little patchwork just as much as the next quilter, but this one just wasn’t exactly singing to me! I was feeling pretty, “meh” about it, maybe my particular aesthetic just craves more open, negative space or maybe it was the combination of colors….too much color, I had just been using the 2.5 inch (too small in my opinion) scrappy squares that I already cut last year and was determined not to add any new ones. Whatever it was, it didn’t fully sink in until I was quite far along. About 2/3 of the way through, I knew drastic measures must be taken in order for ME to be happy with the end result. I just kept wanting more negative space, less…….. well less everything- color, print, squares. 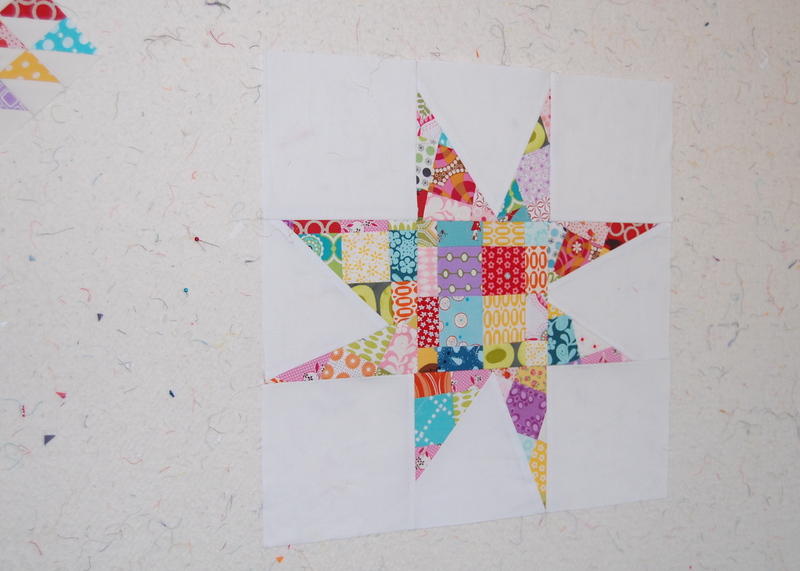 So upon remembering that I have the freedom (yes it is my work after all) to transform this work into what I want/need it to be, I decided to sacrifice a few squares, okay a lot of squares, and turn it into a sweet and simple little scrappy star quilt! I was tempted to make a few various sized stars for this quilt but I chose I guess to go in an even more minimal direction. It looked a little stark to me at first but the scrappy binding pulls it all together for me. Is this my favorite quilt that I’ve made? No, however I love that this quilt came to be out of something that was destined for my growing and neglected “unfinished objects” pile. I love that I have more of this patchwork left so that I can create another quilt out of this formerly, unloved little project. And most of all I love that this project made clear to me the abilty that we all have to transform something that is not serving us or working out for us, into something that feels right and that we can be happy with. I love that through the creative process, we can discover parallels to our life as a whole. Just like in life, I have the freedom to transform my reality into one that works for me and those around me as well. I am in control of my existence and my creative endeavors. It’s really through the process, not the end result that we gain the most value. 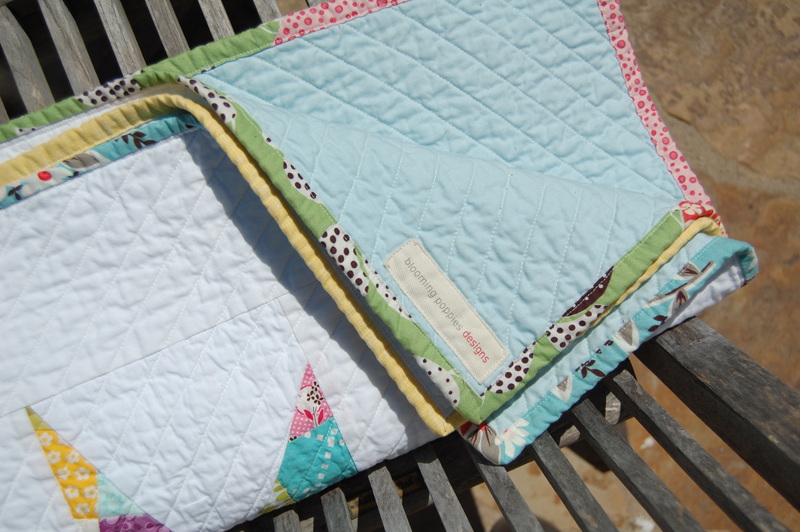 Although I must say, when it comes to quilts, the end result can be pretty rewarding! :-) I invite you to view the listing for this quilt, here! SOLD!! Also, thank you again for all your warm and kind well wishes on my last post. Well done, and Well said! 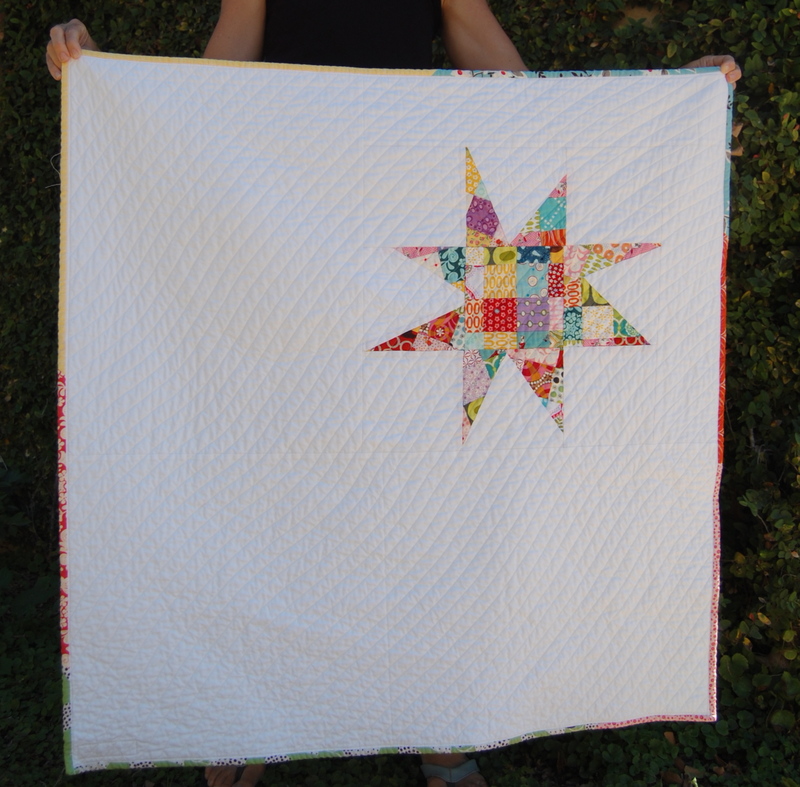 Thanks for the food for thought, and it IS such a sweet quilt! Oh ~ and I’m loving this one Karen! What a great rescue! I love your little star. Fabulous quilting too. You did exactly what I do to my quilts when I dislike them, cut them up and turn them into something else. Sometimes your love your quilts and sometimes you don’t. Good for you! This just happened to me this morning with a quilt back. Thanks for the “lesson”. I’m working through my stash and I will remember your experience and words. In fact I have bookmarked this post so I can refer back to it! Thanks again. Good for you going with what would make you happy and not what you thought you “should” do. I love that scrappy little star! I’ve had a scrappy star on my to-do list for awhile; thank you for more inspiration. It feels so good to redo something that’s just not working for you, and turn it into something you’re delighted with. I recently had a similar revelation about how I like to piece–quick, cookie-cutter tops just don’t do it for me; improv piecing is what I love. Slower, but so much more fun and creative!! BTW, is the link supposed to take you to en Etsy listing? It doesn’t. Thanks Lynn!! I just fixed the link! 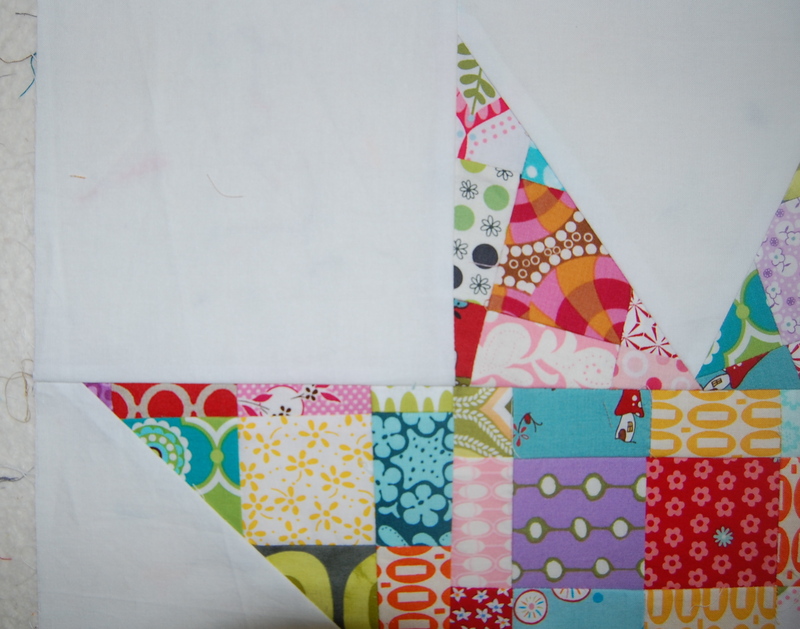 I really like the way that you cut up the quilt to make an even better quilt. 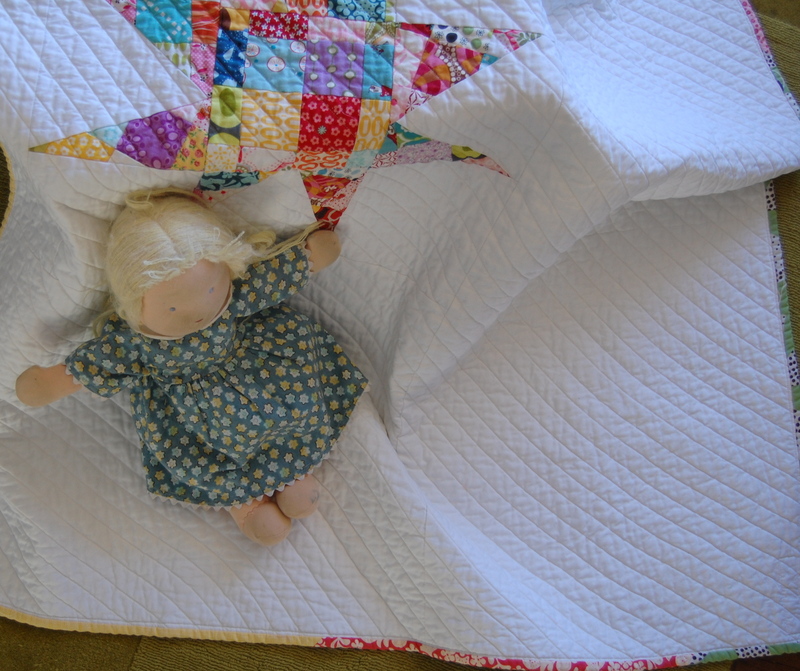 If it were me, I probably would have continued the quilt and not used it. You work is inspiring. As for your pain, I am sad to hear that you are still experiencing pain. It is hard to work through. But I do know that sometimes when we journey through our pain and experience healing, we become a different hopefully richer person. Blessings to you. Amazing quilt. 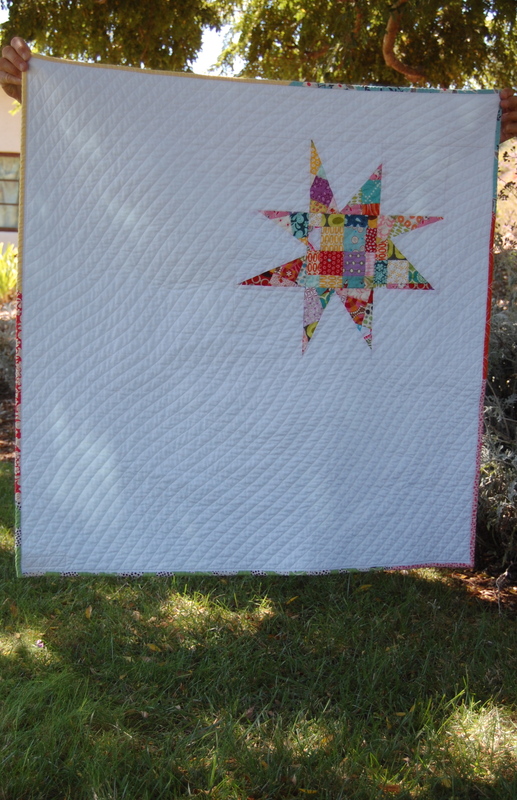 I’m a new quilter; tips on pieces this quilt & star? May I ask how you did the quilting? Did you start in one corner and then work diagonally? I love it! Thanks Susan. I must say, it’s been quite a while since I completed this one so I can’t say for sure but my vague memory of this quilting is that I started from the corner and went through the middle diagonally, working my way out on either side. Hope that helps.